By TIMOTHY AEPPEL and MARK MAGNIER for WSJ.com - Having devoured many of the world’s factory jobs, China is now handing them over to robots. 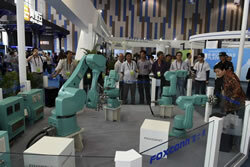 China already ranks as the world’s largest market for robotic machines. Sales last year grew 54% from a year earlier, and the boom shows every sign of increasing. China is projected to have more installed industrial robots than any other country by next year, according to the International Federation of Robotics. China’s emergence as an automation hub contradicts many assumptions about robots and the global economy.